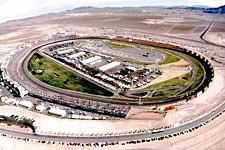 Las Vegas Motor Speedway has the distinction of being the first completely new superspeedway to be built in the southwest region of the United States in more than 20 years. But along with everything else in this glamorous corner of Nevada, growth is a sign of the times. Las Vegas Motor Speedway, which first hosted a NASCAR event in 1996 --the NASCAR Craftsman Truck Series season finale. Jack Sprague rolled to victory in that historic event. A new attendance record for a Nevada athletic event was established the week of Feb. 25-March 1, 1998, when an estimated 250,000 fans converged on Las Vegas Motor Speedway for an extravaganza of auto racing activity. The track features a 1.5-mile superspeedway, a 2.5-mile FIA-approved road course, a 4,000-foot drag strip, paved and dirt short tracks, motocross circuits, stadium truck racing facilities, go-kart and Legends cars layouts as well as a Junior Drag racing strip. Speedway Motorsports Inc., which purchased speedway in December, is already busy at work making improvements to the facility situated in the northeast Las Vegas valley near Nellis Air Force Base. Construction crews are currently building a ramp at the west end of the 1.5-mile grandstand seating, just off the first turn. The 250-foot pedestrian ramp will enable fans to enter the facility from Checkered Flag Lane. More than 25,000 cubic yards of soil have been moved to create the ramp and expand a third-turn berm for additional seating. Additional temporary seating overlooking the third turn is being added, bringing total seating capacity to more than 120,000. Track officials said permanent restroom facilities are being designed and will be ready for the 2000 season. Two new vehicle entrances onto the property are being added. One is northeast of Checkered Flag Lane off Las Vegas Boulevard North. The other is being constructed off Hollywood Boulevard. Finally, a helipad is being added at the end of the existing drag strip, just west of the superspeedway. Location: A short drive from downtown and the strip, take Interstate 15 north to Speedway Exit 54. Carson City, Nev. - The Las Vegas Review Journal says U.S. Rep. Dean Heller of Nevada introduced a bill that would amend the Internal Revenue Code of 1986 and extend the depreciation period for motorsports facilities such as the Las Vegas Motor Speedway. The Motorsports Fairness and Permanency Act, which has been referred to the House Ways and Means Committee, would classify raceway and speedway complexes as seven-year property for purposes of depreciation. The current provision covers all permanent tracks that host at least one racing event a year and are open to the public for the price of admission. The provision will expire at the end of 2011, the newspaper said. Former President George W. Bush signed the American Jobs Creation Act into law in 2004, classifying raceway and speedway complexes as seven-year property for purposes of depreciation, an established practice for many commercial property owners, according to the Review Journal.